Predicting every major college football game in 2018 — Sorry, Internet. The Florida Gators' Chauncey Gardner-Johnson and CJ Henderson. You put a "W" or "L" for each game of the season to project whether they'll win or lose that game. As you go, make sure that the inverse result goes in the corresponding field for that team's opponent in each game -- the spreadsheet has no way to know if you make an error by putting a "W" or "L" in both instances of the same game. As the season goes on, you write in the real result of every game on the spreadsheet with a "W" or "L" in a separate column. The "Correct?" column automatically takes the data you put into the "Result?" column to let you know if you were correct or not. The spreadsheet compiles each team's real-life record, as well as your record in the accuracy of your predictions for that team. Your prediction accuracy also compiles at the conference and national level further down in the spreadsheet. So, again, here's the link to the public version of this year's sheet for you to use should you please. And here's the link to my filled-out version, so I can write about my picks now. Last year for me was a mixed bag -- I had Alabama winning the title, which was correct. But Bama beat Clemson in the semifinal, and my Playoff pick from the ACC last year was Florida State. I actually had Clemson finishing with the third-best record in the ACC last year because I also overestimated Louisville. I had Oklahoma winning the Big 12, which they did, but I had them doing so with three losses, so I didn't have them going to the Playoff. 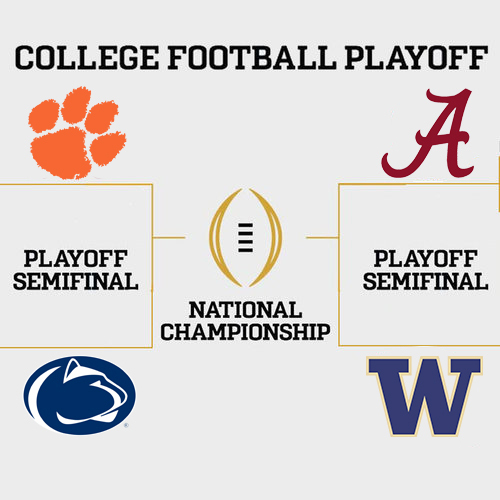 Instead, I chose two Big Ten teams in Ohio State and Penn State -- when ultimately, the Big Ten wound up with zero teams making the Playoff. I had Georgia finishing at 8-4 so that was a clear whiff as well. Only one Playoff team correct, but I did have the title winner correct. Here's this year's projected final Top 25 -- and P.S., Bill Connelly's S&P+ previews over at SB Nation are an excellent resource for learning about teams that you're not sure about. Clemson runs the table, but I have them losing to Penn State in the Orange Bowl this year. Alabama wins the SEC again, but I have them losing to Washington in the Cotton Bowl. I'm going with wacky this year, because I'm sorta tired of seeing Alabama and Clemson play each other. Washington defeats Penn State for the national championship, because why not. Georgia and Alabama face each other in the SEC title game, with Bama winning. I would prefer for Georgia to not be this good please. I do have them dropping one regular-season game, to South Carolina in week two, which would be a pretty big upset. I have Florida going 9-3 with losses to UGA, Mizzou and Mississippi State. I have Mississippi State finishing at 10-2, just ahead of 9-3 Auburn in the west. Clemson blows Miami out in the ACC championship again. I do really like Miami's team this year, and I have them going 11-1 in the regular season. The only game they lose in my projections is a Friday night game on the road at Boston College. Still, they seem to be a few steps behind Clemson, who will finish undefeated. It should be fun to watch them play at Texas A&M in week two, though -- you've gotta think that Jimbo Fisher isn't super stoked about leaving FSU and still having to deal with Dabo. In the Big Ten, Wisconsin loses a close title game to Penn State. I love Wisco this year; I have them going unbeaten in the regular season, including a win on the road against Penn State, but PSU will be tough to beat twice. I've got Ohio State dropping games to TCU (neutral site, during Urban Meyer's suspension) and at Penn State, but if they beat TCU with Meyer suspended then there's a totally probable chance that they run the table. Washington beats USC in the Pac-12 title, completing an undefeated season. I'm not sure who Washington should lose to this year, but I don't think it'll be Auburn in week one and I couldn't pull the trigger on anyone else toppling them. USC looks good, but a freshman QB and a meh coach doesn't inspire me to have them run the table -- I have them dropping their second game to Stanford. They don't lose again until the Pac-12 title game, though. Stanford and Utah finish 9-3 for me. TCU has a big year and beats Oklahoma in the Big-12 championship game. I like Oklahoma a lot, having them lose only at TCU and at Oklahoma State; TCU loses only at Texas. All five conference champions are never this good, so this won't actually happen, but in my predictions TCU becomes the first one-loss conference champion to miss the Playoff due to two undefeated conference champs and two more impressive one-loss conference champs. Oklahoma State and Texas finish 9-3; over in the land of independents, Notre Dame finishes 9-3 as well. All of this will undoubtedly be proven wrong in the coming months, and I can't wait for another year of college football. Even though I'm putting this spreadsheet online super late, I hope some folks have fun filling it out. Maybe next year I'll try to figure out a project to write an app for this!